At lunch time last Thursday I was taking small steps on my knees behind a very young boy who was taking even smaller steps with his even smaller feet. Both of us were pushing a huge ladder back chair. It is this little boy’s first “Petö” block and he is doing extremely well. He only began attending the integrated Montessori–Conductive Kindergarten four weeks ago and he is already well settled in. Is it a bear or is it tea? He is a delight to work with and can be really funny, that is when I can understand his German. He is not difficult to understand because of his accent but because of a speech defect he has. He has very few teeth, which is one of the many symptoms of the syndrome he has, making pronounciation of certain letters unclear. All the Ss are replaced by Gs or Ys. Hence my new name, now used by all the children and staff, “Yogi”! One child in the group comments that this is not actually a name, it is in fact a type of tea! I am still trying to decide if it is an improvement on the old name, “Ushi”, given to me a couple of years ago by another child who had difficulties getting her tongue around my real name. On Thursday we were making our slow but sure and very peaceful progress over to the neighbouring room to have lunch with all the other children. My boy had actually hoped he was returning to Kindergarten for a sleep, but food came first! Always at the time when we return with the “Petö” children for lunch the Kindergarten is a hive of activity, with children rushing past us as they return from the garden, to go to the bathroom, wash hands and make their way to the table. To us who live in the slower lane while driving our ladder-back chairs, it appears that their clockwork has been over wound! If they are “unlucky” some of these high-speed children get stuck behind a crocodile of ladder- back chairs and four-point sticks as we pass through the door to the Kindergarten. This is precisely what happened that day. One very active, unable-to-sit-still-for-a-minute boy had stopped absolutely still to let us pass. He stood as stiff as a toy soldier watching every move that we made. We must have looked pretty odd, with me on my knees and my “little man” taking tiny steps while pushing what for him must seem to be a chair made for a giant. This boy’s question made me smile and made me think of my recent posting on magic and clowns, time and timing. I suggested to the still-as-a-statue child that he might like to put his hands on my shoulders and walk along at the same speed as us, maybe he could even help us to go a bit faster. I said to him that by moving slowly he may see a little bit more of the world that he is always rushing through. Instead he decided to stand as still and as quietly as a mouse and watch the ladder-backcrocodile go by, awaiting the moment when the doorway would be empty and the path clear for his dash to the bathroom and thence to the dinner table. I had just asked this boy to walk with us slowly and quietly to his place at the table, but no, that would just take too much of the time that, for some “unknown reason, today’s six-year-olds do not seem to have much of. .
Could it have something to do with their life at home? In September many of the Kindergarten children will begin school. Then they will discover what it is like to have to sit still. They will really discover what it is to have no time, when they return home with lots of homework. Then, when that’s out of the way, they will have to rush off for music, sport and various other activities that they will try to fit in between school and bedtime. What a difficult timeless, time our “Petö” children are living in. 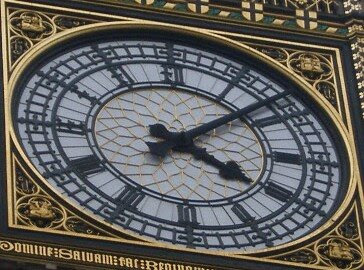 “Big Ben” – actually the name of the bell and not the clock.